Rumors on the street are saying that Channing Tatum has or will be dropping out of the Gambit movie. The Wrap found some inside info indicating that Channing Tatum's contractual deal with 20th Century Fox is developing issues and Tatum is looking to exit the movie project known as Gambit. Rumors or insiders are saying that both parties are in talks right now, but that things are not looking good. This is odd, considering it is being reported that this was a Tatum "passion project" of his. 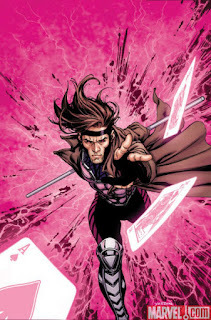 I also find it odd or suspect timing, that this news comes on the heels of the casting movie news for the Gambit film. It brings to mind how hard Edgar Wright worked at bringing Ant-Man to the screen, then in mid-production, creative differences rose their ugly heads with Wright and Marvel/Disney (Marney). But still, I was looking forward to Tatum playing a Marvel character. We'll see what happens and how much is true and what develops.